http://cahs-acss.ca/wp-content/uploads/2015/07/Access_to_Oral_Care_FINAL_REPORT_EN.pdf -accessed July 24, 2017. Created by the authors from the analyses of the 2007–2009 Canadian Health Measures Survey data. 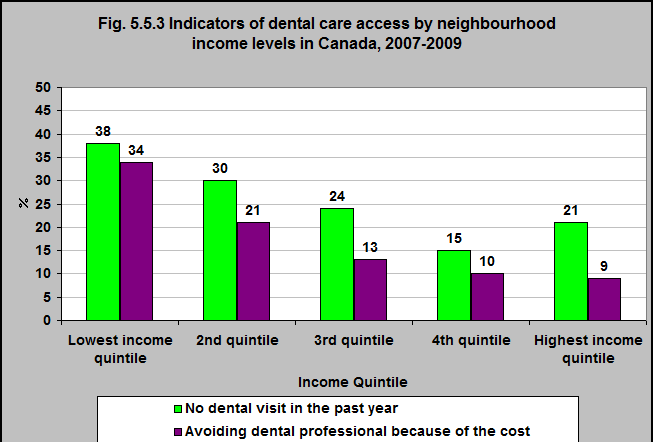 In 2007-09, families living in low income neighbourhoods were less likely to access dental care. 38% of families in the lowest income quintile did not have any visits to the dentist in the past year, compared with 21% of those living in the highest income quintile. 34% of families in the lowest income quintile did not see a dental professional because of the cost, compared with 9% of those in the highest income quintile.